Happy new year, everyone! I hope you all find what you want and need in 2015. Let’s make this year as awesome as it can be! There were a lot of things that happened in 2014 that weren’t particularly happy. In fact, I cried quite a bit over them. My family’s had some hard times this year and it’s affected everyone in the family. While I never much care for any tests life might throw our way, I understand they’re key to showing you exactly how well knit your family is. I’m so grateful and thankful to be part of this family, and I know I would suffer greatly without every single member. Amid the upsets of 2014, there were so many great things that happened, I just can’t write the year off. Since I always try very hard to have no bad days, that means I deliberately look for all of the good things that happened in a day. Finding passion for even the simplest pleasures can help re-balance you from bad things. Libras are all about balance, so that process seems to work pretty well most of the time! If I had the chance to do something over, I’d probably make the same mistakes. As long as you take what you’ve learned and apply it to the future, you should be able to break out of any ruts! Keeping in tune with the positives-are-OMG-awesome vibe, I’m going to go over all the great stuff from 2014. 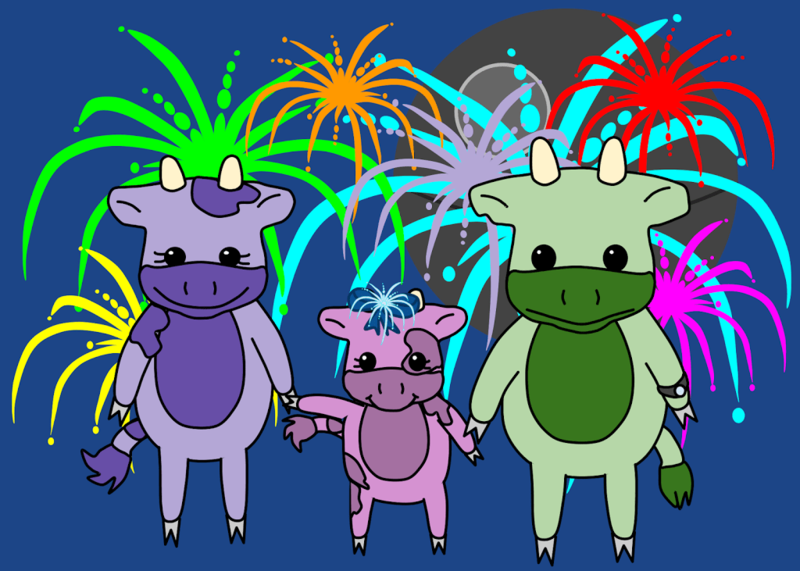 The first most awesome thing about 2014 is I feel like I found my writing groove in the Moo Family and Moo School series. I’ve always loved drawing AND writing, but I don’t have the patience for a comic. Children’s books never really occurred to me until a friend and co-worker suggested it. I’ve done art for my nephew’s book, but that isn’t the same as writing and drawing your own book. I also don’t really like the art I put in that book, and have plans to re-do the art someday. Considering most of it was drawn while I was pregnant with my daughter, I don’t know if/when that will ever happen. It’s on my someday list! I published six books in 2014, five of which were two different series featuring Moo and her parents, Mama Moo and Daddy Moo. The first book I published this year was ANOTHER suggestion from another good friend of mine, who encouraged me to do SOMETHING with my Personality Rune process. Is it a coincidence that the two girls who encouraged me so much have similar names? I don’t think so! Sara and Sarah, thank you both for your encouragement. My family’s always so nice to me, I have trouble believing them when they tell me I should do something 😛 Hearing it from good friends helped solidify everything! Since I publish all six of these books on Smashwords, Amazon Kindle, Createspace, and Google Play Books, you can find the books in almost all online retailers. They’re even published in the UK! I’ve been blown away by the number of Personality Rune books others have wanted, since I know Runes are a very personal thing. What works for one person might not work for someone else. I started the Moo School series with the idea of teaching my daughter all of those important things children should know before they start Preschool. Shapes, Letters, Numbers, and Colors. I’m half-way done with the series, and hope to complete it this year. Moo needs to learn all of this stuff before school starts, after all! The Moo Family series is really a compilation of the silly things my baby girl does. Not everything Moo and her friend Moo (TWO MOOS?!?) do are what my daughter has done, but you can bet she’s just as sly as Moo’s friend Moo. She’s always up to something, and trying to hide it from you! You can find these books in all of these places online, although some are search results, so you might find books written by someone else (sorry!). Jean Hopkins on Barnes & Noble – eBooks and Print books. Not all books in the search results are written by me! Jean Hopkins on Kobo Books – eBooks. Not all books in the search results are written by me! Jean Hopkins on Createspace – Print books. Not all books in the search results are written by me! I hope everyone has a wonderful 2015. Take care!